In our blog series „Crochet by You“ you will find lovely projects made by crocheters using Free Crochet Patterns by My Hobby is Crochet Blog. Today's featured projects are 2 pleated crochet skirts and 2 cardigans: one short sleeved cardigan using the shell stitch and one long sleeved cardigan using the Twin V-stitch. To open the page with the Free Crochet Pattern used for each project, click on the bold words in the description under each picture! 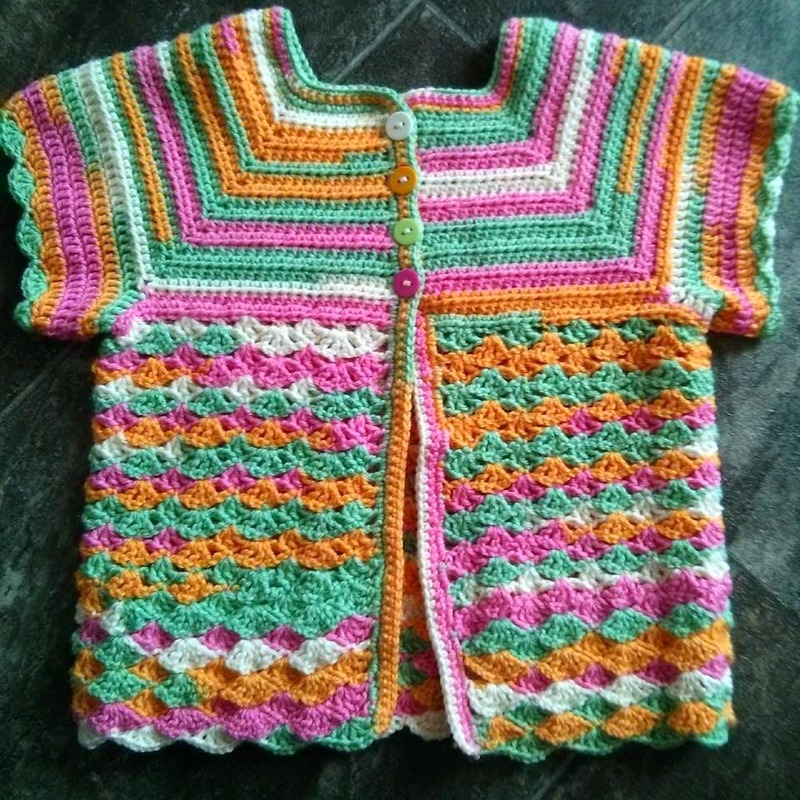 1) I love this colorful short sleeved cardigan made by Gemma Pinkstaryarns Lancaster! She did such a great job with it! She transformed my Iris Top Pattern into an open cardigan and made short sleeves adding 5 more rounds of hdc and a nice shell edging! Beautiful! The free pattern for the top is available in 2 sizes: 18 mo -2 years toddler and 3 - 5 years girls. 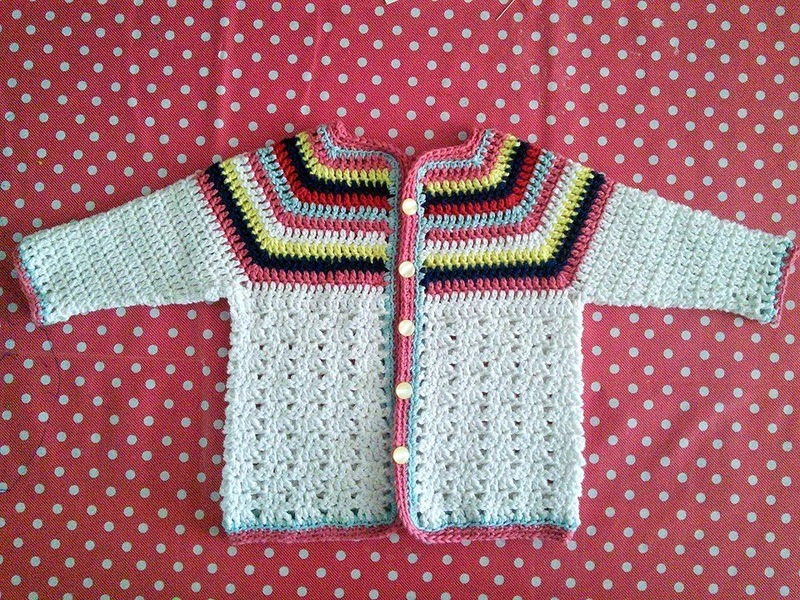 2) Patrice Murphy made this pretty Twin V- Stitch Toddler Cardigan based on my Free Pattern Little Girl's Cardigan, available as written instructions and crochet chart. The original pattern is short sleeved, Patrice brought her own contribution, adding long sleeves. I don't have any info regarding the way Patrice made the sleeves, but for an idea, you can check out this blog post featuring a long sleeved cardigan handmade by Chickie Magoo with the description of her own changes. 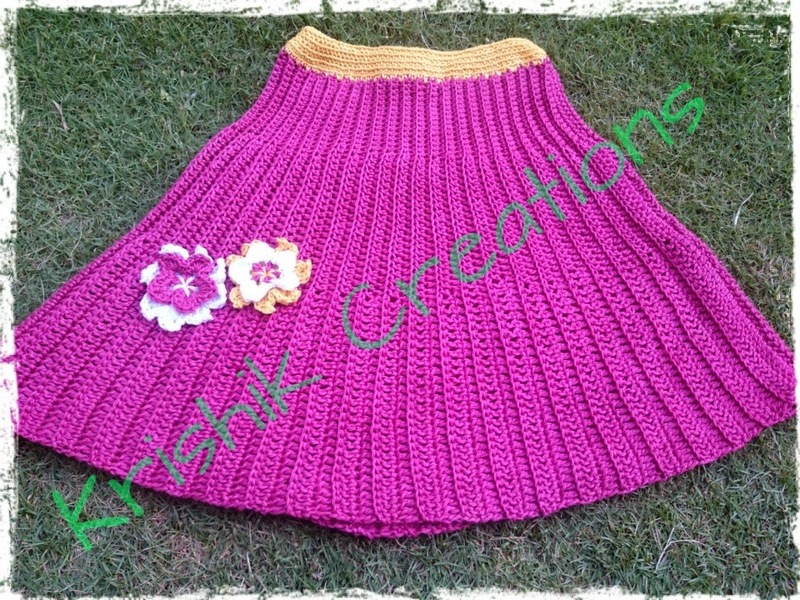 3) Shikha Purbey made this pretty crochet skirt based on my Free Pattern Pleated Toddler Skirt. The skirt is worked side to side and has an an elasticized waist for easy put on/take off. Shikha made a larger size as in the pattern indicated starting with more chains for the foundation chain. You can actually count the stitches in her picture, after zooming in! 4) Here is a cute striped version of the same Pleated Skirt Pattern, handmade by Renuka Kakkar Vinod. Renuka opted for a draw string with pompoms instead of elastic. Very nice as well! Thank you very much ladies for sharing your lovely creations with us! I hope you enjoyed them also, dear readers! For more inspiration check out here the projects featured the previous weeks. 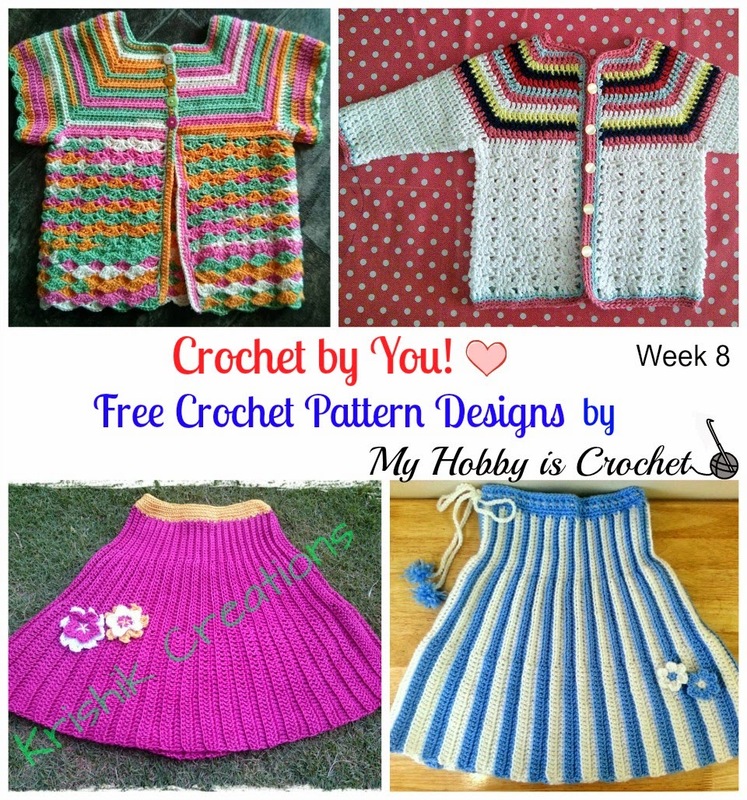 Have you also made something using My Free Crochet Patterns and would like to be featured on the blog? 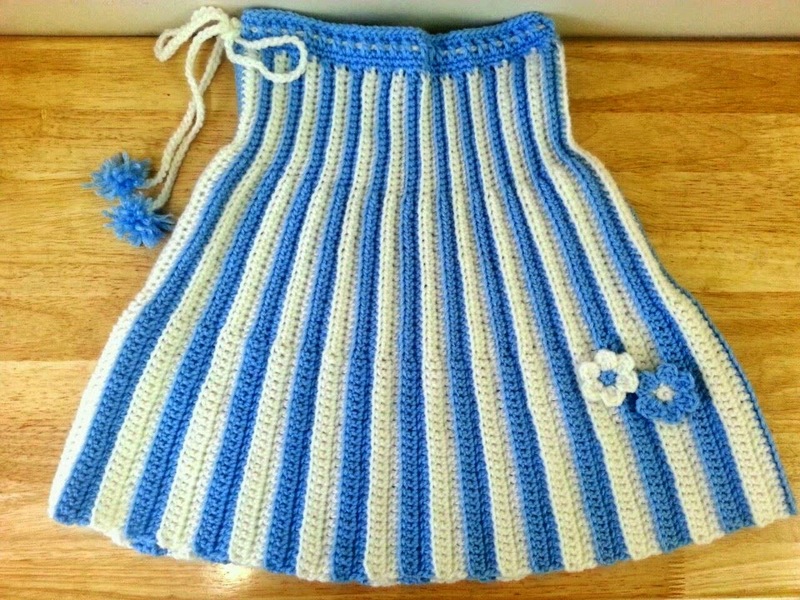 Please upload pictures of your beautiful creations to my Facebook Page Myhobbyiscrochet.